THE President of the National Association of Nigerian Traders (NANTs), Ken Ukaoha, has said that only a few people are aware of the commitments made by their governments in the agriculture policy instruments. Speaking at a one day training and capacity- building workshop organised for journalists covering agriculture by the body in collaboration with Trust Africa in Abuja recently, Ukaoha said little wonder nobody appears to be putting governments in check or holding them accountable leading to continuous underdevelopment and aggravation of poverty. “This training was conceived against the backdrop that the agriculture sector remains one of the strongest sectors for job creation, economic diversification and poverty reduction; and regrettably, the sector has not been receiving adequate attention particularly in terms of making front burner reportage. Ukaoha said journalists need to understand the principles of the Comprehensive African Agriculture Programme (CAADP) framework, its instruments and processes which transcends from the continental level down to the regional and national levels. “CAADP was developed by the African Union with the aim of stimulating and facilitating increased agricultural performance through improvements in policy and institutional environments, access to improved technologies and information, and increased investment financing in the sector. 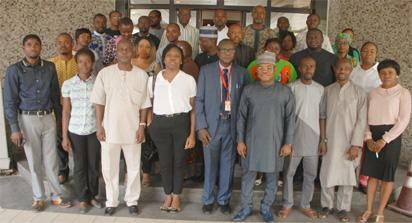 At the end of the training, which had in attendance about 40 representatives drawn from various media organisations including print, electronic and online media, participants expressed reservation over Nigeria’s performance and level of commitment to the implementation of Malabo Declaration. The participants noted that the poor performance of Nigeria is worrisome as the country was deeply involved in the evolution and development of CAADP, propagated and signed by the former President, Chief Olusegun Obasanjo, making Nigeria a political father of the continental instrument. They said regrettably that Nigeria has only two realised commitments out of the seven committed to in the Malabo Declaration. The participants listed the areas as commitment to the CAADP principles and boosting intra-regional agricultural trade. Participants agreed that the media has a responsibility for tracking the agriculture budget especially given that the commitment to Malabo Declaration of allocating at least 10 per cent of national annual budget to agriculture, and agriculture is one key sector where capital budget is higher than recurrent, and must therefore be effectively monitored so as to know the level of implementation and the overall impact on the lives and livelihoods of the citizens. The post There is need to monitor govt spending on agric – Ukaoha appeared first on Vanguard News. Previous 2O19: No alternative to President Buhari?